IntestiCult™ Organoid Growth Media are complete growth media that support establishment, expansion and long-term maintenance of intestinal organoid cultures from human or mouse intestinal crypts. Developed in collaboration with Dr. Hans Clevers and Foundation Hubrecht Organoid Technology (The HUB) this complete and defined medium generates organoids from intestinal crypts in less than a week. These ‘mini-guts’ retain the crypt- and villus-like domains, a central lumen and all major cell types found in the adult intestinal epithelium. 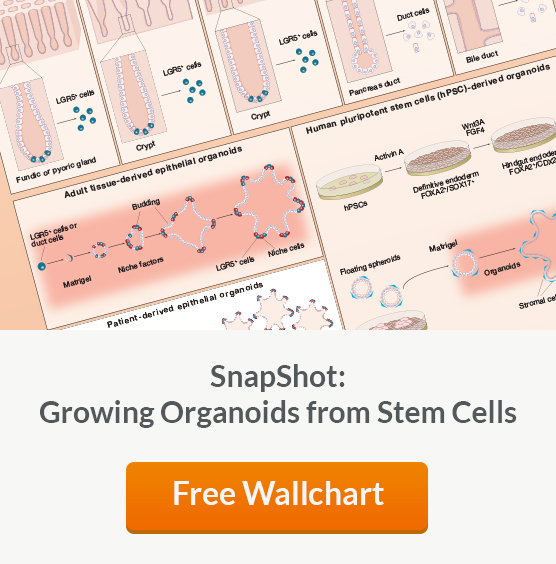 The organoids are functional and ready for use in a number of research applications including disease modeling, drug screening and tissue regeneration. We are pleased that STEMCELL will be our partner in making specialty media for growth of organoids available to the scientific community. 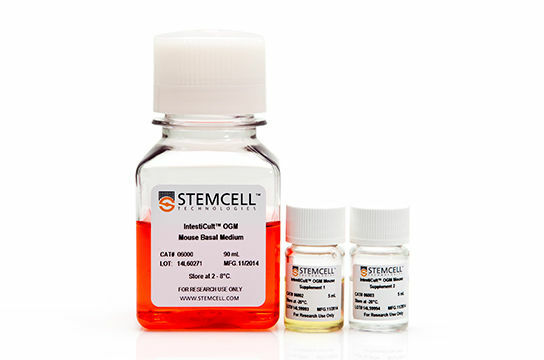 The broad availability of off-the-shelf cell culture media from a world leader in the development of specialized cell culture media and cell separation products represents an essential step in the further implementation of this exciting technology. Studying the intestinal epithelium can pose multiple challenges. In vitro monolayer cultures are convenient but lack key structural features and the cellular diversity of an adult intestine. In vivo animal models allow experimentation on an intact intestine but are often more difficult and expensive to run. Intestinal organoids, or ‘mini-guts’, address many of these issues by providing a convenient in vitro system that has high physiological relevance. In this video Dr. Ryan Conder discusses the research potential of this culture system. Intestinal organoids are three-dimensional multicellular structures that retain key features of the adult intestinal epithelium, such as the crypt- and villus-like domains, a central lumen and the major cell types: intestinal stem cells, Paneth cells, goblet cells, enteroendocrine cells and enterocytes. Organoid culture is a convenient and physiologically relevant tool that can be used in a variety of research applications. 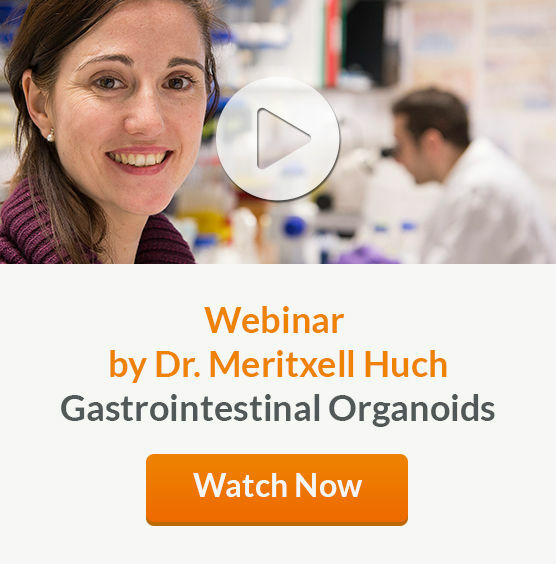 Watch this video to learn how you can easily incorporate organoids into your research. COMPLETE. A complete medium that does not require additional growth factors. PHYSIOLOGICALLY RELEVANT. Organoids retain key features and all major cell types found in the adult intestinal epithelium. ROBUST. Efficient and reproducible generation of organoids in less than one week. CONVENIENT AND EASY-TO-USE. Simple format and easy-to-follow optimized protocol. Dr. Hans Clevers and his research team have made significant contributions to the field of stem cells and organoid culture. In 2007, Dr. Nick Barker et al. identified the presence of LGR5+ stem cells in the intestinal crypt. In 2009, Dr. Toshiro Sato et al. published a protocol for establishing organoid structures from intestinal crypts or single intestinal stem cells. The protocol described the culture conditions that would support long-term expansion of these organoids without requiring a mesenchymal niche. In 2014, Dr. Clevers and The HUB foundation for Organoid Technology signed an agreement with STEMCELL Technologies to manufacture and distribute cell culture media for organoids. 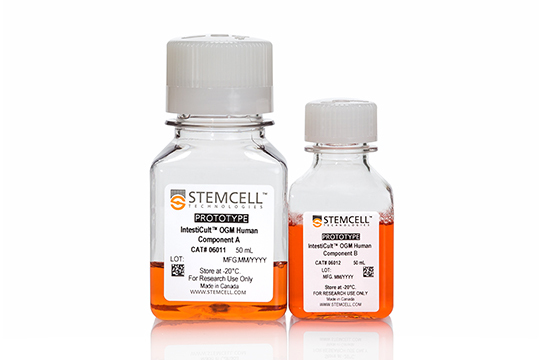 Since then, the release of IntestiCult™ Organoid Growth Medium (Mouse) in 2015, and IntestiCult™ Organoid Growth Medium (Human) in 2017 has provided researchers with a convenient, complete and affordable medium for establishing organoid cultures. Grabinger T et al. (2014) Ex vivo culture of intestinal crypt organoids as a model system for assessing cell death induction in intestinal epithelial cells and enteropathy. Cell Death Dis 5: e1228. Sato T et al. (2011) Paneth cells constitute the niche for Lgr5 stem cells in intestinal crypts. Nature 469(7330): 415-8. Koo B-K et al. (2012) Controlled gene expression in primary Lgr5 organoid cultures. Nat Methods 9(1): 81-3. Farin HF et al (2014) Paneth cell extrusion and release of antimicrobial products is directly controlled by immune cell-derived IFN-γ. J Exp Med 211(7): 1393-405. Wilson SS et al. (2014) A small intestinal organoid model of non-invasive enteric pathogen-epithelial cell interactions. Mucosal Immunol 8(2): 352-61. Zhang YG et al. (2014) Salmonella-infected crypt-derived intestinal organoid culture system for host-bacterial interactions. Physiol Rep 2(9): e12147. Yui S et al. (2012) Functional engraftment of colon epithelium expanded in vitro from a single adult Lgr5⁺ stem cell. Nat Med 18(4): 618-23. Dekkers JF et al. (2013) A functional CFTR assay using primary cystic fibrosis intestinal organoids. Nat Med 19(7): 939-45. Schwank G et al. (2013) Functional repair of CFTR by CRISPR/Cas9 in intestinal stem cell organoids of cystic fibrosis patients. Cell Stem Cell 13(6): 653-8. Matano M et al. (2015) Modeling colorectal cancer using CRISPR-Cas9-mediated engineering of human intestinal organoids. Nat Med 21(3):256-62. Ranga A et al. (2014) Drug discovery through stem cell-based organoid models. Adv Drug Deliv Rev 69-70: 19-28.